COLUMBIA, Mo 10/21/15 (Beat Byte) -- Columbia city manager Mike Matthes says he has a "strategic plan" to reduce poverty, income inequity, racial inequality, and other social problems. But the New York style parking racket he and his minions have instigated in downtown Columbia is only ratcheting up financial pressure on those who can least afford it: downtown workers and merchants losing business to the Internet. Every public parking space downtown is either metered or garaged, granting City Hall an unavoidable monopoly with sharp teeth. Parking fines have tripled under the Matthes-McDavid administration and city-contracted towing services charge double their usual fees when meter maids order cars towed for delinquent tickets. Meter readers tell me they're "working overtime to issue tickets," hitting the streets just before meters go live in the morning. Unloading my car for an event in City Hall, I was hit with a ticket just minutes after my meter became active. "Like they really want us downtown," my wife said sarcastically. Columbia resident Mark Flakne posted a 15-minute, 4-part video documentary of his encounter with Matthes' parking racket on Facebook and Youtube this week, drawing howls of protest, anger, and even despair. After a meter maid ordered his son's car towed, Flakne headed to Doug Perry Towing to pay what he thought would be $50 to $85 -- Perry's usual rates to tow regular and all-wheel drive (AWD) vehicles, respectively. Then the New York part of the racket walloped Flakne's wallet. The city-ordered tow job for his son's AWD cost nearly twice the going rate, $145. Impound fees add another $25/day. Cash only. A Perry Towing employee overheard on the video likened the higher rates to "restaurants charging more for Mother's Day Brunch" or "how hotels raise their rates when there's a football weekend." "My son is a poor college student," Flakne explained. "The City has collected well over $1,000,000 from the parking utility already this year -- money gained on the backs of college students and service workers." Other parking racket horror stories rolled in on his Facebook page. A downtown art gallery's intern -- towed. A graduate school assistant -- towed, and forced to pay $300 after weekend storage. "I guess I won't eat the rest of the month," he quipped. A man towed over a case of mistaken license plates: the meter reader logged zeroes instead of the letter O, generating a record of tickets that didn't exist. Even if you pay -- or think you paid -- all your parking fines, record-keeping snafus can still mark your car with a scarlet letter -- or in this case, a green tow tag. In an 8-minute filmed encounter with an impatient city employee named Richard, Flakne discovered a confusing record of his son's parking fines. He had paid all of them -- he thought -- online, but a balance of $135 remained. "I really don't know what's due," Flakne tells Richard, after going through the city's records. "We thought everything had been taken care of." "If he was worried about it, he should have called us to make sure everything was paid in full instead of doing everything on line," Richard tells Flakne about his son. But Matthes has pushed all of his departments to do more work online, from utilities to parking fine payments. And "most things in the modern world are paid online," a surprisingly calm Flakne says. 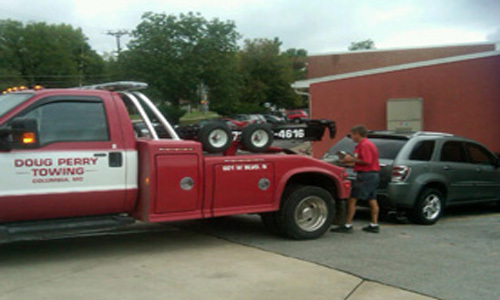 "If you're worried about being towed, you probably should take responsibility and call down here," Richard interrupts. Flakne asks for more clarification after reviewing the records again. "I don't mean to be rude, but I'm not going to sit here and go through this all day," Richard says. "I just don't see this going anywhere." TOTAL PAID, ALL CASH: $380. Columbia city officials wonder why the Internet is trouncing sales -- and sales taxes. Jefferson City, which has no metered parking around its downtown merchants, just announced a $1.5 million sales tax surplus.